Do you have a detailed plan to implement the new FASB not-for-profit financial reporting standards? During this two-part webinar series, industry experts will walk through the conversion of a not-for-profit organization's financial statements and notes to ensure an efficient and effective implementation of FASB ASU 2016-14. Join us to learn how to overcome the most difficult challenges stemming from this new standard, through examples of various board-designation actions, walking through converting net asset classifications, tips on liquidity disclosures, and expense allocation methodologies that will help Community Action Agencies satisfy the new requirements. Part One of the webinar series will cover liquidity and net assets, while Part Two will cover functional expenses and other impacts. The webinars will include a detailed implementation tool you can use to ensure you have covered all requirements for your organization. To purchase a recording please email CAPLAW at caplawinfo@caplaw.org. Did you receive a codec error message? Some computers require the Windows Media Player Codec plugin to view a recording. The plugin is available for free in the Microsoft Download Center. You may have to contact your computer administrator to download the plugin. Presented by Allison Ma'luf, Esq. and Christopher Logue, Esq. The Community Services Block Grant (CSBG) Act is the legal cornerstone of Community Action. While the Act itself is short, it contains many important requirements. This webinar offers an introduction to the Act for Community Action newcomers and serves as a refresher for seasoned leaders. Topics covered will include an overview of laws and guidance relevant to CAAs; uses of CSBG funds; income eligibility; tripartite boards; state plans; monitoring; and funding reduction and termination. Public community action agencies (CAAs) face unique opportunities and obstacles in operating their programs. In this webinar we will explore the relationship between a public CAA’s tripartite board and staff and the local government entity of which it is a part. In particular, we will analyze the authority delegated to the CAA, the role of the tripartite board, and the ways in which a public CAA can fulfill the goals of the Community Services Block Grant Act. Maintaining a healthy and sustainable CAA requires an organization not only to keep ahead of new requirements but also to maintain compliance with existing rules as it responds to the changing needs of the communities it serves. In this session, we will discuss the legal and practical impact of the proposed Communtiy Service Block Grant Act (CSBG) organizational standards. We will also address the ways in which CAAs are permitted to use CSBG funds and the limitations that must be considered. We will focus on issues relating to eligibility for CSBG services, especially when leveraging CSBG funds or integrating intake processes, along with the limitations in the CSBG Act relating to property and facilities. Taking a proactive approach to the CSBG monitoring process will place a CAA on the road to becoming a healthier and stronger organization. Join Allison Ma'luf, Esq. of CAPLAW for a webinar that will discuss actions a CAA can take to affect its success in a monitoring before it is even selected by its state CSBG office for a review, and much more. Focus on Community Action Agency (CAA) tripartite board composition and selection. Get answers to questions such as: How many directors should a CAA have? How should directors be selected? Must low-income sector directors be low-income themselves? Can a director send an alternate to a board meeting that he or she cannot attend? How can a CAA get rid of ineffective or troublesome directors? What are the responsibilities of a tripartite board? The Community Action network has participated in many discussions recently about the Organizational Performance Standards proposed by the Community Action Partnership. These Community Action Agency standards are intended to increase the accountability and capacity of CAAs to achieve their anti-poverty mission by requiring specific organizational practices in nine areas, such as leadership, governance, human resource management, strategic planning, and financial operations. This webinar will look at the legal angle of some of the standards, such as those in the governance and human resources areas, best practices on how to use legal resources to meet the standards, and legal issues relating to implementation of the standards. Today, Community Action Agencies (CAAs) face unprecedented challenges due to an increased demand for their services, decreased government funding, and intensified competition for that funding. CAAs are being held to higher standards of accountability in terms of their ability to exercise effective financial oversight and stewardship, to comply systematically with the many laws and regulations that apply to their operations. Yet, at the same time, a few CAAs have encountered ethical lapses and compliance crises that have jeopardized their funding and required them to lay off staff, terminate programs and, in some cases, close their doors. Be sure your organization is prepared to avoid crises and meet current challenges. Attend this session and learn about CAPLAW’s new compliance and ethics toolkit, as well as actions CAA boards and management can take to establish and maintain a strong ethical culture and effective compliance throughout the organization. One of the most important responsibilities of a CAA’s board of directors and executive management team is to ensure that the organization is financially sound and compliant. This webinar will focus on the requirements applicable to the federal funds CAAs receive. Topics covered will include the history and applicability of the Office of Management and Budget Uniform Guidance; administrative requirements and financial management systems under the Uniform Guidance, federal cost principles; Single Audit requirements; nonprofit CAA financial statements; and annual budgets. Does Our CAA Effectively Estimate and Reconcile Indirect Costs? In this webinar we will considered the impact of over- or underestimating an indirect cost rate. We discussed what reporting and reconciliations are required under the Uniform Guidance for those CAAs that wish to request a four year extension of their current rate. We also explored the benefits and downsides of extending your current rate. What is the Best Option for Calculating Our CAA's Indirect Cost Rate? The Uniform Guidance continues the options for submitting proposals for federal indirect cost rates that were previously included in OMB Circular A-122. Learn how indirect cost rates are computed using the Simplified Allocation Method, Multiple Allocation Base Method, and Direct Allocation Methods and understand the pros and cons of utilizing the permissible choices for bases (total direct cost, salaries and wages, and total personnel costs). We discussed how to apply for an indirect cost rate and explore the potential benefits of changing methods along with opportunities to raise or lower your rate at your next negotiation. Will the 10% De Minimis Indirect Cost Rate Work for Our CAA? Learn which organizations may receive the 10% de minimis rate and what “indirect costs” will be covered with this rate. We discussed how a CAA would calculate an actual indirect cost rate using the Modified Total Direct Cost (MTDC) method required for calculation of the de minimis rate by the Uniform Guidance. We explored strategies for addressing a reality where actual indirect costs are higher or lower than the 10% de minimis rate. What Impact Does the New Guidance Have on the Treatment of Indirect Costs? In this webinar, we provide an overview of the impact of the Uniform Guidance on a CAA’s ability to charge administrative and other indirect costs to its federal awards. We discussed the potential conflicts between federal statutory limitations on administrative costs and new Uniform Guidance provisions and explain ways which your CAA can deal with both. For CAAs without federal indirect cost rates, we explored the pros and cons of using a cost allocation plan to support charging administrative costs as direct costs. We contrasted this approach with utilizing the 10% de minimis rate allowed by the Uniform Guidance. We also looked at the most common problems encountered by CAAs with federal indirect cost rates. What does it take to be truly effective as a Chief Financial Officer (CFO) in Community Action? The answer for most CAAs goes way beyond the basics – an excellent knowledge of accounting principles, OMB Circular requirements, and specific funding source compliance issues. Today’s CFO must also be an outstanding communicator and a true strategic partner for the Executive Director. Effective CFOs provide tools to help managers test the financial impact of new strategies and monitor progress toward key financial goals. Increasingly, CFOs are cash management experts – dealing with daunting challenges when state reimbursements slow down or contracts are delayed. Many CFOs wear multiple hats, managing IT, HR, and facilities functions as well as core accounting and financial reporting. Learn how experienced CFOs are finding the time required to shift their focus to new demands by streamlining accounting functions, and how new CFOs are getting the support they need to be effective in the complex world of Community Action. Discover new tools that CAAs are using to focus board attention on their organization’s most important financial choices and challenges. In this session, we will explore strategies to build your board’s understanding of your CAA’s current financial health and the increased emphasis that funders are placing on organization-wide sustainability and management capacity. We will evaluate new formats for financial reports and the value of dashboard presentations that use graphics to convey important trends and comparisons at a glance. Attendees will learn how improving the presentation of financial information can actually improve the usefulness of Board discussions by helping board members identify and evaluate the choices they need to make to strengthen their organization and monitor progress toward increased sustainability. Across the country, Community Action Agencies are experiencing heightened auditor and Inspector General interest in cost allocation plans and practices. CAPLAW and the Partnership have teamed up to produce a new Cost Allocation Toolkit designed for CAAs who do not have federally negotiated indirect cost rates and face the torturous web of cost allocation requirements in A-122 and layers of additional, at times conflicting guidance from specific federal and state programs. This webinar will cover key aspects of time and effort reporting and cost allocation, including: what’s required; red flags that may mean you need to look at PARs; what is best practice; and practical advice for doing them well. The webinar is based on a new guide from Wipfli created in partnership with CAPLAW and the Community Action Partnership. This webinar discussed the innovative collaboration between 9 nonprofits to share services and how these shared services now better serve the children and families of Charlotte, NC. The webinar is moderated by Kay Sohl of Kay Sohl Consulting. Data can be overwhelming. Community Action Agencies, often to comply with funder requirements, build and manage complex financial recordkeeping systems that can result in information overload. An effective dashboard report distills data to some key measures and makes meaningful comparisons to benchmarks and goals. With greater clarity, organizational leaders can focus on the most relevant information to make strategic decisions. Budget Builders: Who Does What? Why is it Important"
Your budget may be the most important document your CAA will create this year. It will guide your use of resources and ensure your continuing capacity to deal with the daunting challenges of poverty in your community. Budget Builders will provide practical strategies to organize your annual budget development and approval process amidst uncertainty and ongoing financial stress. This new webinar will explore multiple approaches to obtain meaningful Board and staff input on key choices and build buy-in and support for the budget which emerges. An agency-wide budget helps a community action agency ensure that it has accounted for all the dollars in its fiscal year, and that all the dollars are in their proper place. Using a model agency-wide budget, participants will learn how to diagnose occurrences of duplicate funding of positions or expenses; identify the size and timing of funding gaps; establish “drop dead” timelines and contingency plans in case funding doesn’t materialize; highlight positions that may be vulnerable and the appropriate personnel actions that may be required; and use advance knowledge and planning to mitigate financial risk. Many boards fail to recognize that although a CAA is a nonprofit, it also is a business. This in-depth session will emphasize why all CAA board members must focus on their CAA's finances if the board is to avoid problems and discharge its fiduciary duties. Webinar participants will explore who should lead the board discussion of financial statements, the roles that management and the finance committee should play, and what steps the board should follow as it reviews financial statements. More than Math is designed to give board members, who are not experts in finance or accounting, tools that enable them to participate in the discussion of their CAA’s financial issues. Auditors use the COSO framework to understand and evaluate your internal controls. Learn how you can use the COSO framework to develop more cost effective controls and streamline the audit process. Spot old fashioned approaches to controls that may be wasting time and leaving your systems insufficiently protected from fraud in our electronic age. Explore new strategies to address the risks which emerge during periods of budget cutbacks and cash flow problems. Guest Panelist: Mike Zeno and Mary Pockl, CPAs, S.R. Snodgrass A.C. Learn how to avoid common audit problems by being prepared for your audit. Auditee responsibilities in the audit process; the impact of internal controls on financial statement process and audit preparedness; receive updates on stimulus package requirements and how that may affect your audit and your audit costs. CAPLAW and the Community Action Partnership have teamed up to offer a series of three webinars focusing on a team approach to cultivating and administering program budgets. The series adds a new perspective to the old adage "the whole is only as good as the sum of its parts" by exploring the cross pollination that needs to occur within a CAA to produce compliant and successful programs. View the recordings and more information on the Community Action Partnership website. The right steps are essential to successfully implementing an organization-wide paper and electronic records management program. In this webinar, we will consider some basic records management concepts, the first steps to take in planning and organizing your records, how to create a file plan and create a record retention schedule, and more. Learn some of the key ways to effectively manage and organize your physical and digital records. Did you know that most fraud is discovered through hotlines and whistleblower reports? In this webinar, you will learn about legal requirements for whistleblower policies and how to create and implement effective policies for your CAA. Confused by conflicts of interest? You’re not alone. Community Action Agencies are expected – and in some cases, required – to adopt and implement conflicts of interest policies. Yet developing these policies and applying them to actual situations can be a daunting task, especially given the many different rules from various sources that may apply. In this webinar we will distribute and review sample policies and provide practical tips for drafting, implementing and using conflict of interest policies to resolve problematic situations. This webinar will emphasize—analysis and corrective action—those parts of the quality improvement cycle that alter performance. Emphasis will be on illustrating how executive directors and program managers utilize internal control systems to define quality, assess performance, and target enhancement strategies. Management attention will be demonstrated as critical to the success of sound policies and procedures. Learn how to structure your planning processes to yield useful frameworks to guide financial, program, and leadership choices…and how to avoid unfocused, duplicative, unbearably long planning processes that drain resources and yield untouched doorstops. Join CAA Executive Directors, Fiscal Officers, Development Directors, and Board Leaders for this 90 minute interactive session to explore practical strategies to integrate your planning efforts to chart your course through the tough choices CAAs confront as community needs explode and public funding resources shrink. Note: Due to technical difficulties, this recording begins at slide 13. The handouts are complete. Risk Management: An Organizational "Flu Shot"
This webinar will illuminate the dimensions of risk that CAAs should consider on a regular basis. This session will highlight activities which integrate risk management, strategic planning, agency-wide budgeting, and performance improvement planning. Participants will walk through a risk management planning process, with examples from several experts. ISO 31000:2009, a new international risk management standard, will be examined. Participants will use a checklist to identify risk management practices they already use and others they should add to their planning processes. Filling nonprofit CEO and CFO positions is growing more challenging as the boomer generation begins its exodus from the nonprofit sector. While the recession has delayed some boomer exits, it has also created a new pool of applicants with high level corporate experience, opening new opportunities and pitfalls in transition planning, Explore new strategies to plan for leadership transition and create flexible opportunities for highly skilled professionals to provide transitional leadership. Experts recommend that nonprofits review their bylaws at least every three years. When was the last time your organization reviewed its bylaws? Learn what you need to think about when updating your organization’s bylaws. Presented by Eleanor Evans, Esq. and Veronica Zhang, Esq. Given that federal grants represent a major source of funding for CAAs, it is important for CAA leaders to have a working knowledge of federal grant law. This webinar kicks off the series by covering the key statutory and regulatory compliance requirements for both public and nonprofit CAAs as recipients of federal grants. We will discuss the grant life cycle; requirements for CAAs entering into subaward agreements; lobbying and political activity restrictions applicable to federal grantees; and a CAA’s options when a federal agency takes enforcement action against the organization. Thinking and acting proactively is critical if a CAA’s Head Start program is to not only survive but thrive. In this session we will learn from the mistakes of others and explore actions a CAA that may take to strengthen its organization and avoid Head Start recompetition. We will discuss the most recent guidance for five-year project grants and identify common problems that have placed grantees on the recompetition list. We will also explore proactive steps an organization can take to avoid those problems as it prepares for its next round of monitoring. Marijuana is now legalized in some form in 29 states, and with polls showing a majority of Americans favoring legalization, the trend is likely to continue. 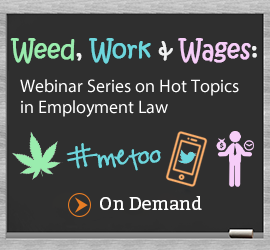 From drug testing to disability accommodations to workplace safety and compliance with the federal Drug-Free Workplace Act, marijuana in the workplace raises a host of issues and concerns for employers. This presentation will overview how marijuana legalization impacts the employer-employee relationship, with an eye towards developing practical solutions to common pitfalls for employers. This webinar will explain how the #MeToo movement has altered the landscape of workplace harassment. By applying the current state of law to actual case studies, we will help your CAA understand, investigate, and respond to allegations of sexual harassment. We will also discuss ways of preventing this behavior in the first place, from establishing policies and procedures to creating a culture of respect in the workplace. With summer quickly approaching, now is the time to review the policies and practices that affect your internship and volunteer programs. Recent guidance from the Department of Labor’s Wage and Hour Division substantially changed the test for determining whether a person can be properly classified as an unpaid intern. In addition to federal requirements, state and local jurisdictions continue to enact provisions affecting internships—and failure to comply can be costly. Social media has transformed the way we live and do business, but it has also created a host of new compliance issues in the workplace. During this webinar we will discuss the benefits and risks of using social media to screen job applicants; limits on when an employer can terminate an employee for inflammatory or offensive posts on social media; federal restrictions on common employer policies; and how traditional concepts of harassment and retaliation in the workplace are applied to employees’ behavior on social media. Note: In June 2018, the National Labor Relations Board (NLRB) released new guidance on workplace rules, policies, and employee handbook provisions that appear neutral, but could be interpreted to unlawfully interfere with an employee’s exercise of rights under the National Labor Relations Act. The new NLRB guidance adopts a more employer-friendly approach to these workplace rules, substantially relaxing the concerns discussed in this webinar regarding a CAA’s social media policies. See CAPLAW’s August 2018 e-Bulletin article for more information about the new guidance. In the first webinar, learn from an experienced retirement plan auditor about: which retirement plans are required to have audits; what auditors look at when conducting an audit; how to prepare for the efficient completion of your plan’s next audit; what are the most common errors found during a plan audit and how your organization can avoid those errors. In the second webinar, a seasoned retirement plan attorney will help you understand what your organization must do to fulfill the fiduciary responsibilities of a plan sponsor under the Employee Retirement Income Security Act (ERISA). You will also learn about steps your organization can take to correct plan compliance errors. The presenter for Webinar Two, Attorney Michele Golkow, provided additional information regarding two questions that were raised during the webinar; that information can be found on the last page of the Webinar Two handout. The U.S. Department of Labor recently issued its long-anticipated “overtime rule,” which affects whether certain employees may be treated as exempt from the minimum wage and overtime pay requirements of the federal Fair Labor Standards Act. The DOL estimates that the new overtime rule, which will go into effect on December 1, 2016, will extend overtime protections to an additional 4.2 million exempt workers who are not currently eligible for overtime pay. This webinar reviews the changes in the new overtime rule and how they apply to CAAs, discusses various options for compliance, and addresses common employee classification issues, including the classification of Head Start teachers. To accompany this webinar, CAPLAW issued an extensive FAQ addressing the new overtime rule and its implications for CAAs. Wondering how to determine whether particular CAA staff members are considered full-time employees under the ACA and whether employer mandate assessments will apply if health coverage is not offered? Our first webinar will help CAAs apply the employer mandate rules by explaining how those rules apply to a number of common CAA situations, including Head Start staff who are laid off during the summer and individuals enrolled in job training programs. Attendees will learn how to address a number of key situations in applying the employer mandate and basic rules for addressing other situations. Concerned about which of the new IRS reporting requirements under the employer and individual mandates apply to you? What data do you need collect? When do you need to submit and deliver the new forms? How do you complete those forms? Our second webinar will discuss these new reporting requirements, focusing primarily on IRS Forms 1094-C and 1095-C forms, as well as key issues to be aware of when collecting information and reporting. Attendees will leave this webinar with a framework for meeting the new requirements as they begin to examine the new forms and instructions. Preparing for uncertain times is not always easy. CAAs are often faced with potential funding cuts and program changes that affect their most valuable resource, their employees. Don’t wait until you are faced with these difficult scenarios to assess your CAA’s staffing options. Attend this webinar to learn about the applicable employment laws affecting different staffing choices and ways to reduce your employment law liability relating to those choices. In this session we will focus on the wage and hour issues associated with alternative employment arrangements such as furloughs and reductions in an employee’s pay and hours; the discrimination laws that are triggered when an employer is making staffing changes; the application of the federal layoff notice law, the WARN Act, for certain employment actions; and the documentation and evaluation procedures that every employer should have in place to help protect it from potential claims. Employee Benefits Check-Up: Are You in Compliance with the Affordable Care Act? As employers work towards compliance with the Affordable Care Act many questions still remain. Attend this webinar to hear about the latest developments in implementation of the health care reform law and their impact on employer-sponsored health plans. Topics discussed will include not only provisions that are currently in effect, such as the 90-day waiting period limit, but also upcoming requirements such as the “pay or play” mandate and the nondiscrimination requirements for fully insured plans. Employee Benefits Check-Up: Are You Ready for the Affordable Care Act? Health Care Reform is an undeniable reality – the U.S. Supreme Court upheld the Affordable Care Act in June 2012 and the November presidential and congressional election results quieted the political dissenters. Now, it's time for employers to get to work preparing for its full implementation. Attend this webinar to hear about the latest developments in implementation of the health care reform law and their impact on employer-sponsored health plans. Topics discussed will include: an update on preparing for the “pay or play” mandate; preparing for upcoming nondiscrimination and auto enrollment requirements; handling medical loss ratio rebates; complying with the requirement to provide a summary of benefits and coverage; and reporting the cost of group health plan coverage on W-2 Forms. The face of discrimination has changed markedly since the passage of landmark workplace civil rights protections nearly 50 years ago, Title VII of the Civil Rights Act of 1964. These days, the EEOC’s charge inventory consists increasingly of disability, age, and retaliation matters, protected categories that can now cover a majority of the American workforce. The cost of defending EEOC matters has steadily increased, perhaps to the point where employers think they can no longer fight when they’re right. And worse, non-profits have increasingly landed on the EEOC’s radar. This webinar will help participants sort out which EEOC matters pose real risk and which ones do not, based on the EEOC’s recently released 2012-2016 strategic plan. Once armed with the ability to triage risk, employers can make more strategic decisions about when to bear the certain expense of retaining outside counsel or alternatively, when to realize the incredible cost-savings of D-I-Y participation in the EEOC’s administrative process. Test your wage and hour prowess by working through several scenarios that address some of the trickier federal Fair Labor Standards Act (FLSA) issues faced by Community Action Agencies (CAAs). This practical look at the FLSA will aid CAAs in discovering ways to reduce wage and hour law liability. We will focus on alternative employment arrangements in tough economic times such as furloughs and reductions in an employee’s pay and hours; the accurate classification of Head Start teachers; training and travel time for non-exempt employees; and compliance with the salary basis requirement by avoiding impermissible deductions that can jeopardize an employee’s exempt status. Are you confused about when and how your community action agency (CAA) must accommodate employee requests for individualized treatment? Do you struggle with striking a balance between accommodating employees and maintaining a productive and effective workplace? This webinar will provide you with practical suggestions on how to respond to such requests, especially ones for religious observances and/or a “disability.” We will examine the Americans with Disabilities Act Amendments of 2008 (ADAA) along with other discrimination laws as we carefully explore an employer’s duty to provide reasonable accommodations. We will also discuss the role of the “interactive process” and the “undue hardship” defense along with the policies and procedures your CAA can implement to help protect itself from liability and optimize its operations. If you manage employees’ requests for leave, you may need a generous helping of alphabet soup. That is not the A to Z of the Family Medical Leave Act (FMLA), but a serving of the more challenging aspects that often cause management consternation in administering a law that can result in staffing issues, low morale, and perceptions (or reality) of abuse. Mitzi will provide the right recipe for dealing with particularly prickly aspects of the FMLA such as intermittent and reduced schedule leave, leave for grandparents and adult children, the exhaustion of FML time, and the absence of the ADA’s “undue hardship” defense. Mitzi, who represents many CAAs, offers a practical, proactive approach to managing employees’ leave to avoid or limit legal pitfalls and minimize the operational challenges related to intermittent and reduced schedule leave. Presented on Tuesday, April 4, 2017 2:00-3:30 p.m. E.D.T. This webinar focuses on advocacy and lobbying and addresses questions such as: What is the difference between lobbying, advocacy, and education? What kinds of activities are considered lobbying, and what are not? How do we lobby while staying within Internal Revenue Service and federal grant rules? What kind of funds can pay for time spent lobbying and doing advocacy? Presened on Tuesday, April 11, 2017 2:00-3:30 p.m. E.D.T. This webinar discusses the laws that govern how CAAs engage in political activity, and will address questions such as: What is political campaign activity and how is it different from lobbying and advocacy? Can our CAA get involved with activities like voter registration, voter education, candidate forums, endorsing candidates, or issue advocacy? What is the Hatch Act, and how does it limit the off-duty political activity of our employees? Involvement in public policy issues is a must for organizations working to improve the lives of low-income people. In this session, examine the rules that apply to lobbying by CAAs, Head Start programs, and 501(c)(3) organizations and find out how to advocate effectively within those rules. Faced with government budget cuts and increased competition for funding, CAAs are exploring various alternatives for sharing or combining resources to reduce their operational costs and increase their efficiency and effectiveness. Sharing administrative services with another organization can also be a first step towards pursuing closer collaborations, including mergers, with potential community partners. In this webinar, we will discuss the various options for sharing services and the financial, legal, and government grant law issues to consider before doing so. Many nonprofit organizations view mergers as a last resort, a reaction to financial distress or leadership vacuum. But what if CAA leaders considered mergers proactively—as a way to encourage organizational growth, strengthen effectiveness, replicate best practices—and to do so in a cost-effective manner? This webinar will explore how CAAs can reframe mergers as tools for furthering their impact. We will discuss the merger planning process and legal structuring, as well as tackle potential barriers to successful mergers, including Head Start competition issues, organizational culture, and the post-merger integration process. A nonprofit CAA’s federal tax-exempt status is one of its most valuable assets. In this webinar we will review the do’s and don’ts of protecting that status. Topics covered will include advantages and basic requirements of tax exemption under Internal Revenue Code section 501(c)(3); restrictions and prohibitions on 501(c)(3) organizations – including lobbying and political activity; transactions with insiders; unrelated business activity; fundraising receipts and disclosures; and the IRS Form 990. Because of the intricacies of immigration and public benefits laws, it is often difficult for Community Action Agencies working with immigrants to assist them effectively. Controversial immigration laws in states such as Alabama and Arizona have caused additional confusion for CAAs and other human services providers. During this webinar we will outline the effect of immigration status on immigrant clients’ eligibility for benefits and services commonly provided by CAAs, such as Head Start, CSBG and LIHEAP.